Thorough handwashing is an essential way to save your health and prevent the spread of illness, particularly during cold and flu season. Unfortunately, the shocking truth is that 95 percent of people fail to wash their hands long enough to really kill and remove all of the germs after going to the restroom. A third of people don’t even use soap. One in 10 skip the hand-washing process altogether. Now that your skin is crawling, (and you’re silently vowing to do better in the hand-washing department), let’s remember that there is also hand sanitizer to help! And if you have hand sanitizer dispensers placed strategically throughout your workplace, this is one extra layer of cleanliness that can help you in your quest to make your workplace cleaner and healthier. Even if you’re one of those people who dutifully scrub their hands with soap and water for a full 20 seconds after using the restroom, we’ve already discussed the disturbing statistics about everyone else. Those same non-washers go around touching the same phones, coffee pot handle, fridge handle, keyboards, doorknobs and office supplies that you do. And that is exactly how infection can spread so easily, even if you keep your hands clean. A periodic squirt of hand sanitizer from a strategically placed dispenser can help you avoid the ick everyone else is leaving around. Making hand sanitizer dispensers available right from the front desk shows your clients and prospective clients that their health matters to you. This generates a positive impression that you take all the essential details into account in any interaction, and that matters, both to your employees and your clients. Loyal services are a big plus for my business. I look forward to Loyal coming to my shop. The guys have always been friendly, professional and courteous. Making hand sanitizing dispensers available at key places in your workplace can help keep illness at bay, enabling your employees to stay healthier. That way, they don’t miss as many days while out sick. They’re healthier and better able to get their jobs done. Fewer sick days and doctor visits can also help decrease your company’s overall health insurance plan costs as well. Healthy employees… healthy company. A little touchless squirt of hand sanitizer can go a long way to helping you, your employees and clients keep illness at bay. 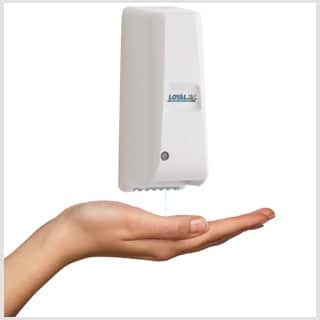 With Loyal Hygiene hand sanitizer dispensers, you also get impeccable service to make sure those dispensers stay filled and functional when you need them the most. Contact Loyal Hygiene today ((703) 361-7888) for a consultation and check out our customer testimonials too!